We were in Amsterdam, and I am not saying this like a brag. I am saying it as a confirmation, because it was such a quick, half-day visit, that it's almost surreal. Almost. As I go through all of our photographs, I am delighted to find that we really were there and we really did see some of the expected sights of Amsterdam. And we made our own paths as well. And we walked those paths. We walked a lot. We were not very well prepared, so this was one of those visits that gets figured out in the moment... which is kind of crazy and kind of cool. There were *mistakes,* but why call them "mistakes" when we can think of them as experiences or learning opportunities? One thing we learned: It is better to walk, train, cycle or tram in to Amsterdam; it is harrowing to drive in to Amsterdam. In Amsterdam the bicycle rules. They enjoy the right of way and they outnumber cars by 42 to 1, more or less. Add pedestrians and trams and all traffic signs in Dutch, and you are presented with an interesting driving experience. There were thousands of cyclists on the road ( I never exaggerate btw) and I think there were millions of bicycles waiting for their turn on the road. It was a huge relief to squeeze in to the public parking building near the Van Gogh Museum, to leave the Espace behind. For the record: In all the world I have never seen a lovelier parking structure than the one for the Museumplein. "Lovely," is not even a word I have ever considered offering when describing any parking lot, but Amsterdam wins the prize. It was well ventilated and well lit. It was clean. Clean. Clean. Clean. There were restrooms and vending machines and classical music was playing at a volume that would simultaneously promote world peace and invigorate tired feet. Quite remarkable. Sure, I would rather be at the beach or in the woods, but as parking garages go... wow. Yes. Yes, we saw the Van Gogh Museum. While this newer museum was under construction, the collection of paintings visited California. I took the boys, Max was only a toddler, to see the entire Van Gogh collection, with my Mom. It was amazing and I made a promise to myself to see it all again. Truthfully I liked Van Gogh before, but really only in a sort of obligatory way. "Interesting," I would have said in an uncommitted, barely convinced way. You have to see the real thing. I am not saying you will like his paintings any more or less, but no print comes close to capturing the energy, the dynamics, the force of his view and his art. So, that when you see the actual paintings, whether you like them or not, you will find something there to make you think or feel or wonder. His art really is interesting. I feel fortunate to have seen those paintings again. No picture taking in the museum. It's sort of too bad, but I know photographs don't convey the depth and detail that emanate from his canvases. You cannot touch the paintings either, no surprise, but my point is that seeing the paintings is a tangible experience. His paintings have so much dimension and expression that I feel as though he is speaking, as though he could walk in the room and scream: "I love these flowers and the heat of the day made me feel anxious and impassioned!" Maria and I looked for the paintings she liked. She decided for herself which paintings were "sad." She worried about him, about this Van Gogh person, who painted dark flowers and tired faces. She asked about him. "What made him sad?" she asked. She actually sighed with relief when she saw "Blossoming Almond Tree." "Now he's happy again," she said. In the gift shop she sat with a book of his paintings, turning it page by page she discussed the light and colors, his changing moods. It was a big book. She studied every page. "Starry Night" is not in the Van Gogh Museum, but she saw prints of it and did not like it... at first. We talked about how sometimes a painting is about how we feel, how the world makes us feel, and not only about how something looks. Her feelings about the painting have evolved from thinking it was odd and dark, and "not very good," to recognizing it and pointing it out, and now she tells me she likes "Starry Night." I like her contemplative, reflective journey. In a four year old, art appreciation is reflected in their comments, and realistically their ability to not fall apart or faint, or whine or run around asking for treats. Maria managed to demonstrate mature and admirable traits of an art enthusiast, so did her brothers. William, Alex and Max borrowed headsets with recorded information and guides to the art, and they each at their own pace enjoyed the Van Gogh Museum. I am not expecting a lengthy, reflective essay from them, but it was a pleasure to turn a corner and see Max deep in thought, gazing. It made me glad to know that neither Geoff, nor William, nor Alex was rushed or distracted. They took it all in. William and Alex remembered their first encounter with Van Gogh, somewhat. They took their time enjoying this visit. I will take my time waiting to hear feedback. This will easily become one of those places that calls to me in my dreams, that insists I return. I am going to say it was indescribable, but of course I will attempt to describe it... it's just hard you know? Outside the place looked like a warehouse, kind of... well, dumpy or non-descript. If it weren't the place we were marching to, we probably would have kept marching. Instead we stepped inside and that was a smart move. Not a warehouse. An oasis. A two story oasis, with tiled walls and painted plates, with gorgeous lamps and a vibe. A vibe is just that thing that happens in a place that is running on creative energy and natural inspiration, and it exists miles away from factory decorated, corporate theme restaurants. You cannot package this or make it a chain. It's got funk and junk and art, it's got a vibe. "What does Maria want to eat?" Maria enjoyed the patience and generosity of many people in Europe, and the wait staff in Restaurant Bazar were especially considerate, obliging. Our waitress addressed Maria personally and waited for Maria to "Hmmmm" and "Uhhhh" and second guess, and elaborately, colorfully decide what to eat and drink. Maria was introduced to strawberry milk, a fruity, tangy yogurt drink served with a festive blue straw. Big hit. She also enjoyed the child's plate of chicken and rice, the frites and fresh fruit and pita bread. The restrooms are downstairs. Maria asked me to take the picture. She was utterly enchanted. So was I. A flash would have overexposed everything, especially with all the mirrors. I hope the beauty of the tiles comes through... it was really amazing. And our table was upstairs. My favorite meal? Maybe. Definitely in the top 10. Ambience, service, price and taste... all factors in a good meal, and of course good company. All categories were satisfactory and more, because, you know... the vibe! In Europe a meal is an occasion. I never saw anyone eating in their car, not even at the rest stops. I never saw people grabbing a bite on the run. Sit down. Chat. Have a drink. Consider your options and chat some more. Ready to order? Yes. No. Relax. No hurry. Sadly, it takes getting used to. We are trained to keep life moving forward and in our familiar world there is no time for hanging out without a purpose or an agenda, or a timer set to keep us on schedule. Happily, we did get used to the easy breathing, slow chewing, relax and enjoy approach to mealtime. This is the life. It is a way to live in gratitude, by acknowledging the blessing of food, the sweetness of company, the luxury of time spent in the moment. I think in the States someone could wind up on Oprah by writing a book about this healthy approach, but at Restaurant Bazar, and most places we went, *take it easy* is just a way of being. I will never look at funky lamps the same way. Swoon. William declared the falafel better than our local favorite... oh dear. The perils of travel... discovering something better than what you can get back home. Amsterdam deserves more than a day, of course. We knew we were cutting it short. Maybe it was intentional and now we know absolutely that if we can, we should return. I'll dream big and imagine us staying in a barge, riding along the canals and visiting the Reik Museum, maybe borrowing some bicycles. We sat here, by the canal, after going through the Anne Frank House-Museum. "Going through" doesn't sound quite right. Her story echoes in the rooms. It made me cry. I cried when I saw the play and read the book and saw the movie. I thought I was prepared for what we would find there, but to comprehend what they faced, what they endured, is to be profoundly moved. What the family went through is one story among millions and the museum effectively reminded me of that... that millions suffered. The other message that is alive in this museum is that we are not through with tyranny and censorship, with prejudice and judgements, that we must still be aware, sensitive, questioning. Oppression hurts everyone. It felt so good to sit by the water, to breath freely. I am so glad we were in Amsterdam. That difference in attitude towards meals annoys many Europeans to no end when we're in the US! It seems so rude to be constantly pushed by the waiter instead of letting him know when you're ready. Even ruder still is to be brought the check with your meal as if to say "hurry up and clear the table for the next patron"! Wonderful post infused with your feelings and impressions wherever you went. The restaurant looks absolutely fascinating - filling your eyes with sights and tummies with good food. It's interesting to see Holland through the eyes of our visitors. One thing that everyone is always surprised about is the large amount of bicycles we have. Maybe it's because our roads are quite narrow and we live in a small country with a lot of people. Have you read the UnDutchables? I think you might like that. I understand your feelings in the Anne Frank house. I had that frightening sound in my head of nazi's banging on the door, like end of one the Anne Frank movies. And I had to think of the stories my parents told me about their experiences during the war. Maybe I'll write more about that in my blog. Please let me know when you're visiting Holland again. Maybe I can give you some tips about places you can visit. Those are lovely photos Natalie! I especially like the one of Maria at the sink... and also those of her going up the stairs. oh the adventures you've had! 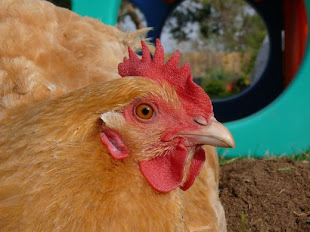 I'm loving my vicarious vacation through Chicken Blog! Your children are lovely, by the way... People who like Van Gogh have to be nice people! OH!!! Natalie it is so surreal to be seeing Amsterdam again through your eyes, lens and with your children in the frame! I have so many similar photos, although as you pointed out, we had better luick with the Albert Cuypmarkt. The restaurant you show is gorgeous! I'm going back there! And it is interesting to hear your perspective on restaurant-y sense of time. It would be lovely to spend time in that place with the tiled wall. We wandered into little antique places that lined the Cuypmarkt, and for a moment I thought you were going to say you had too! I didn't spend enough time in Amsterdam when I went. I was on my way to Morocco. I had almost a whole day but had to get from and to airport and deal with customs so that ate up a large chunk of time. Sigh, I want to go back. Thank you for sharing your wonderful pictures and your adventures. Natalie I am really truly enjoying your adventure through these posts....you are a fabulous writer and the photos are so good at opening up what your trip looked and felt like. Really, you could publish this as a book!